Let’s face it. Holiday shopping can be extremely stressful. Especially when you have that person in your life who seems to have everything. You search high and low for something that’s unique, but ideas seem to be void. You desperately want to get them something meaningful but usually come up short, usually grabbing something off the shelf. What if there was a way to get someone a truly unique, one-of-a-kind gift that moves them instantly? 1. Pet portraits are personal. There’s nothing like a gift that is customized for the recipient. It speaks volumes of how much thought and attention you gave to finding the perfect gift for the person you love. And even if you aren’t the pet lover, chances are you love that pet owner. What better way to acknowledge someone than to recognize what’s important to them. And when it comes to a person’s relationship with their pet, it’s a personal relationship like few others. 2. Pet portraits celebrate special relationships. Pet portrait’s helps us celebrate important relationships in our lives. The portrait becomes a way to help us celebrate that pet and the special moments we shared with them over the years. It’s an especially moving gift when the pet has passed on. We remember what we celebrate. Pet portraits help us celebrate often. 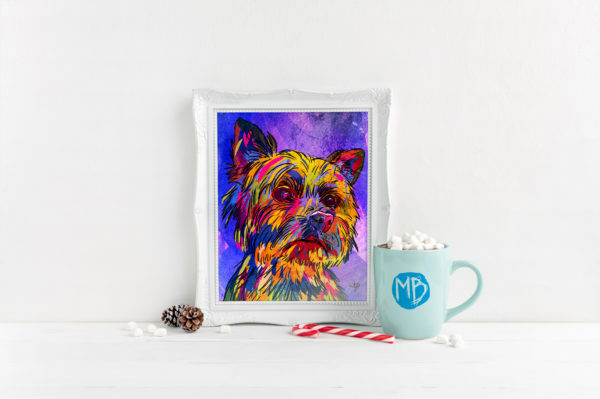 If you’re interested in having a one-of-a-kind, custom pet portrait created for that special person in your life, visit my page detailing the process and info. Act fast though, as time is short and spots are few. You don’t want to miss out on the opportunity to have this unique gift created for your loved one this holiday.